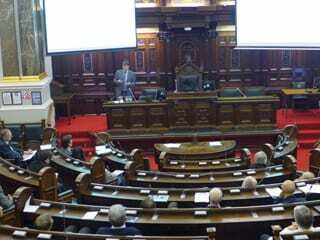 The Branch half-day event and ICorr AGM took place in the Chamberlain Room & Main Chamber of the Birmingham Council House on Wednesday 29th November 2017. The event was well attended and after lunch and refreshments attendees were welcomed to the council chamber by Trevor Box, Midland Branch Chair. The first presentation was on the “Hammersmith Flyover Strengthening – Repairing the Effects of Corrosion” by Graham Stanford of Freyssinet. Graham’s interesting presentation covered the damage caused to the post tensioned structure and remarkable repair techniques employed to strengthen and repair this critical piece of London’s infrastructure. The second presentation of the day covered an Innovative Solution for the Prevention of Crevice Corrosion at Pipe Supports by Clive Evans of Deepwater EU Ltd. Clive’s presentation dealt with Deepwater’s pipe support system to deal with crevice corrosion and the problems caused by crevice corrosion to pipes across a range of industrial sectors. The next presentation dealt with the Cable Impregnation Technique for Corrosion Protection of Grouted Post-Tensioned Tendons by Peter McCloskey of Vector Corrosion Technologies. Peter explained this relatively new technique which has been developed by Vector in North America to deal with corrosion of tendons in grouted ducts of existing post tensioned structures. The final presentation was an overview of “Cathodic Protection Training and Certification: The ISO Requirements” by Jim Preston, Corrosion Prevention Limited. Jim covered in detail the recent changes to the ISO standard and the implications of future training and certification requirements. At the end of the presentations a lively panel discussion took place with some excellent questions from the attendees and much discussion between the attendees and the presenters. The day was brought to a close by the ICorr AGM which included the financial report for the year. 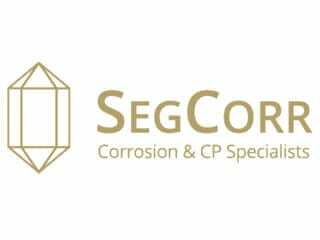 Midland Branch has a new sustaining member, SegCorr Ltd, Independent Consultants Specialising in cathodic protection and corrosion management (more details can be found in preceding section). 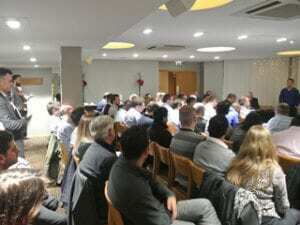 The Branch continued its successful 2017-2018 session with a high turn-out (68 attendees) at its joint event with the Mining Institute of Scotland (MIS) and IOM3 Oil and Gas Division, (Over the last few years MIS has established a strong working relationship with the Aberdeen branch and holds an annual joint technical evening that is funded alternatively). 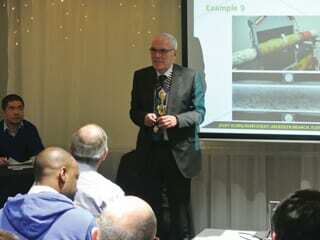 The key topic under discussion was Corrosion under Insulation (CUI). This is a major issue for not only the oil and gas sector, but industry in general, with an estimated annual cost to the UK of £28 billion. The event started with a buffet and a poster presentation from Tianyang Lan, a MSc student from Northampton University, who presented the experimental work that he had been undertaking, assessing both physical and electrochemical techniques for measuring CUI. Two physical methods and two electrochemical methods were used in this test work, Eddy Current Testing (ECT), IR Thermography (IRT), Electrochemical Impedance Spectroscopy and Electrochemical Noise Method (ENM). The samples used to conduct the experiments were carbon steel panels at different corrosion stages, used to simulate the pipe condition, with standard maintenance organic coatings and insulation tapes representing the pipe insulation. Results have indicated that ECT/IRT could not discriminate rusting beneath a coating when it was greater than about 250microns thick however the electrochemical methods showed immense promise. Insulation of course covers all signs of corrosion. MIS, with IOM3 Oil and Gas Division, had arranged two technical presentations. 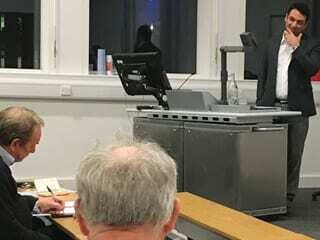 The first was given by Rebecca Allison of the Oil and Gas Technology Centre, (OGTC, a public / private initiative), who introduced the topic of CUI and the role of the OGTC in addressing the challenges of CUI. Rebecca provided an overview of new technologies being supported by the OGTC and got comprehensive feedback from the audience on these, however she highlighted that addressing CUI is not just about technology, a holistic approach including working practices, procedures, competency, human factors and data management is required. Bill Brown and Mike Dixon of The Rope Access Company (TRAC) then built on the overview provided by Rebecca with a presentation providing results from their field and yard trials assessing the latest tools and techniques available to measure and analyse CUI, which included developments with pulsed eddy current and digital radiography. Field and yard work highlighted key issues for practitioners to be aware of. The Oil & Gas Industry has experienced many challenges when inspecting for Corrosion under Insulation (CUI), assessing the condition of steel components under Engineered Composite Wraps and the minimum remaining wall thickness under surface scabs / blisters. The aim of their OGTC supported project is to try and determine the limitations of the available NDT methods relative to each application. TRAC plans to share the ongoing research and development overview obtained to date. At closing, a warm vote of thanks to all the presenters was made by the new MIS President Bob Laird for their valuable contributions which were very much appreciated by all those in attendance. 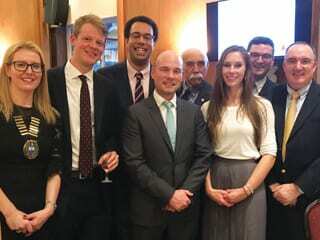 Next year’s joint meeting is already scheduled for 27 November 2018 at the Palm Court. 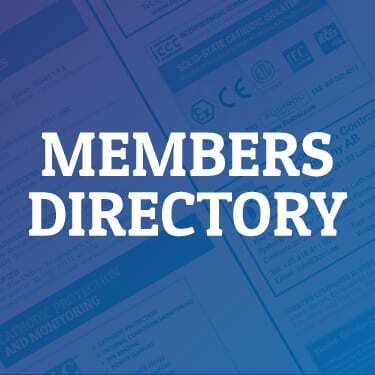 The 2017-2018 ICorr Aberdeen Sponsors currently include: Aberdeen Foundries Ltd, Atkins, CAN Offshore Ltd, CORRPRO Companies Europe Ltd, Cosasco, Deepwater, ICR, IMG Composites, IndCorr, LR, North East Corrosion Engineers, Oceaneering International Services, Permasense, Pipeline Technique Ltd, Plant Integrity Management, Spencer Coatings, Rosen, R&R Corrosion Ltd, Total E&P and TRAC. The company specialises in cathodic protection and corrosion management, and their skills include condition assessment, identification of deterioration mechanisms, development of rehabilitation techniques, the design and specification of corrosion management solutions using galvanic and impressed current CP, protective coatings, material selection and concrete repair. They are experienced in the development of new build and life extension designs which offer whole life cost benefits for critical reinforced concrete and metallic infrastructure. 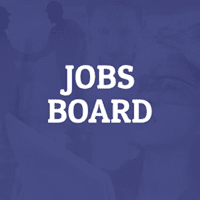 Staff include Level 3 Senior Cathodic Protection Engineers and NACE Certified Corrosion and Cathodic Protection Specialists. 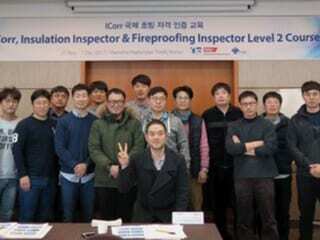 An increase in demand for ICorr certification courses is leading to an increase in international delivery of the Paint Inspector, Fireproofing and Insulation Inspector and Cathodic Protection Technician courses, and recently, ICorr trainer Nigel Peterson-White delivered Fireproofing and Insulation Inspector Level 2 courses to 18 delegates in Busan, South Korea. The high calibre attendees came from multinational organisations such as Samsung, Daewoo and Hyundai, and working in industries such as shipping, marine and oil and gas. Delegates completed 5 days of training and examinations covering the inspection of common types of passive fire protection as well as both thermal (hot and cold) insulation and acoustic insulation. This training was arranged in conjunction with the Corrosion Science Society of Korea (CCSK). The CCSK is a technical society devoted exclusively to scientific and technical activities relating to corrosion and corrosion prevention. Full details of all training and Qualification courses available, and dates of these, can be found on the Institute website.